Build anything you can dream of, all in the real world! 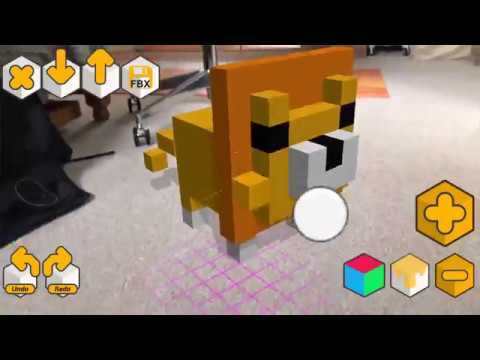 Curious Blocks is a block building creative app for kids and adults alike. Build wonderful 3D characters and worlds with the magic touch of Augmented Reality!
? Utilises the latest technology in iOS Augmented Reality (AR): Thus Curious Blocks requires iPhone 6s or newer devices or equivalent iPads.
? Social is built in: Take pictures of your models and share them on social media to show off your creations. For parents, Curious Blocks is a great way for kids to spend time - expressing their creativity with no mess! The 3D models created can be exported for use in game engines such as Unity, Unreal, and 3D modeling softwares such as Maya, Blender, 3ds Max…etc for the more advanced developer. Satisfy your curiosity with Curious Blocks! Suitable for all ages. Curious Blocks was added by Batccl in Mar 2018 and the latest update was made in Mar 2019. The list of alternatives was updated Mar 2018 There is a history of all activites on Curious Blocks in our Activity Log. It's possible to update the information on Curious Blocks or report it as discontinued, duplicated or spam. MagicaVoxel is a free lightweight 8-bit voxel editor and path tracing renderer. Simple, but powerful voxel graphic editor with 24-bit color support, unlimited scene size and undo buffer, layers and much more. A free voxel editor from Big Bad Wofl. Discontinued No longer supported and no recent development. Qubicle is a professional voxel editor that enables you to easily design charming 3D models with a unique blocky style. Slab6 is a voxel editor that Edits, VOX, KV6, and KVX files. Alternatives to Curious Blocks for Windows, Mac, Linux, Web, iPhone and more. Filter by license to discover only free or Open Source alternatives. This list contains a total of 12 apps similar to Curious Blocks. No reviews yet for Curious Blocks, want to be first? Maybe you want to be the first to submit a comment about Curious Blocks? Just click the button up to your right!